Amanda is a successful and renowned chef originally from the USA. She had her own TV cooking show on a national TV station during the 1990s and was considered one of the most innovative chefs in her home state, where she opened a series of high-quality ‘home-cooking’ restaurants. For several years, Amanda also served as the first female executive chef for an internationally renowned luxury hotel chain. She now owns a successful catering company and food consultancy in the USA. 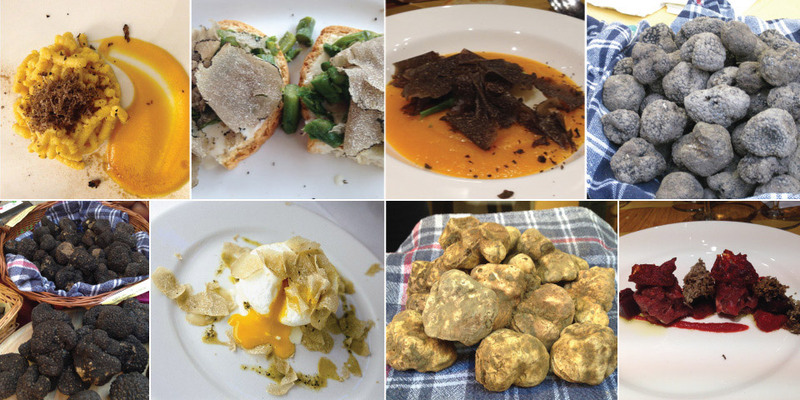 Amanda reached out to Yummy Italy regarding her perplexity surrounding truffles. First, because she was never convinced about the final quality of truffle she received from suppliers in the USA and second, because she had always created truffle dishes that were “over complicated”, as she put it, partly due to the dubious quality and partly due to the lack of knowledge of the conception, growth and uses in areas where truffles grow. She wanted to see, smell, touch, clean and use and eat the freshest truffles possible, in order to create a ‘truffle benchmark’ for herself, both when receiving truffles from her supplier and in the dishes she conceives and cooks. Amanda came to us in late October, during the ‘crossover’ truffle season from the black summer truffle ‘Tuber Aestivum’ to the revered white winter truffle ‘Tuber Magnatum’ and the black winter truffle ‘Tuber melanosporum’. We took her on several truffle hunts locally, in an area renowned for its truffles (the white Tuber Magnatum in particular) at different times of the day, in order to find as many different types of truffle as possible. She learnt about the different soil types, trees, reproduction methods and truffle hunting methods with the trained dogs. She learnt about the ripeness of the truffles when they are found, how to identify a truffle which is still slightly immature, a mature truffle and one that has gone past its ‘best by’ date. We also taught her what to look out for when buying truffles through a local truffle merchant, so as not to be ‘fooled’. Yummy Italy also organised a series of cooking experiences with award-winning restaurants and chefs (Michelin star and Jeunes Restaurateurs d’Europe) in the area so that Amanda could understand how they perceive truffles and how they use them in various types of dishes, from antipasti, to pasta and rice dishes, secondi and desserts. Amanda went back to the USA “all truffled out, but happy” and said “I now have much more respect for this mystery of nature, which I will treat with more care and love in the kitchen and let the truffle shine through in my dishes, rather than smothering them with other flavours”.